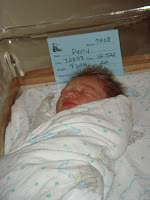 Life with the Perry Duo: Hello World! Well, my fake nesting and welcoming words must have worked because William is here! 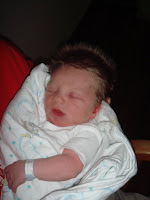 He was born July 23, 2008 a hefty 8 lbs 6 3/4 oz and a whopping 22inches long! We went to the hospital Tuesday night, fully expecting to be told we should go back home, but we were admitted and William was born the next day at 12:52 pm. I loved having an epidural!!!!!!!!!!! The most painful part of the whole process was the nurse who missed my IV three times...and used the wrong gauge needle, and she missed drawing blood. Chad and I have determined that shift change is a bad time to need ANYTHING at the hospital! My second nurse and everyone after that was great! 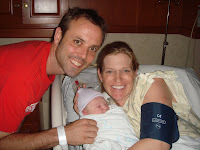 He even waited so that my doctor could be there to deliver him- Dr. Storck- the perfect name for a great OB. 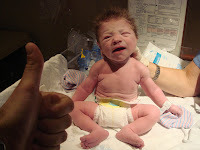 His hair is a riot- everyone at Baptist Hospital where we delivered kept calling him the "rocker baby." Not to brag, but it is pretty cute. 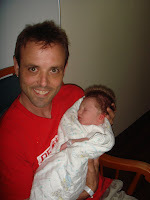 It looks like he has had it styled and the tips frosted- a real Music City baby. Your post just made me cry, am I emotional or what?! Anyway, have fun on your stroll - and it's not too hot today! Jenny and I watched him for like... 30 min last night, he was next to some cutie with a pink bow - already making girlfriends :) Then they took him to the weigher or whatever it was and he totally waved at me! haha. Oh I just love him!! could he be any sweeter. 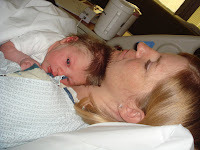 Yes epidural's are amazing, I give props to women who dont use them but me...I am not scared! Sorry you got stuck so much. i love that picture where he is getting weighed and chad is giving the thumbs up. that is awesome. 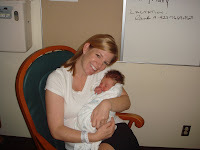 i am so glad that i got to meet little william...he is precious...just like his mommy! can't wait to snuggle with the little nugget....oh he is so cute. Tell Little William that OJJ says, "Welcome to the world little funkateer!"